Three explosions shook three Saudi cities and left at least four victims dead Monday as Muslims prepared for the festivities that mark the end of the fasting month of Ramadan. 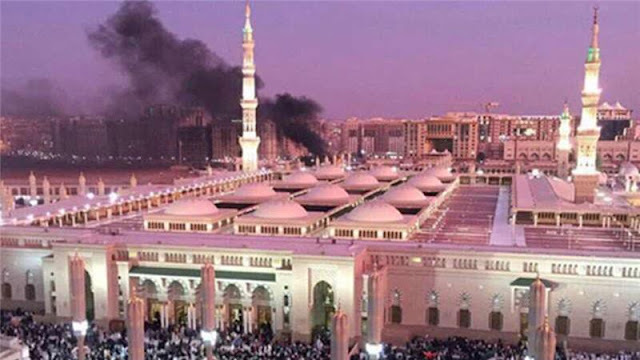 A suicide bomber struck near one of Islam’s holiest sites in Medina, killing four security guards. Around the same time, a second suicide bombing attacked a mosque in the eastern city Qatif, home to many of the country’s Shiite Muslim minority. Body parts from three people were found near the site, the interior ministry said. The evening attacks came hours after a suicide bomber detonated an explosive belt that wounded two near a U.S. diplomatic site in the Red Sea city of Jeddah. No one claimed responsibility for the attacks, which occurred two days before Eid al-Fitr, one of the most important days on the Muslim calendar. The government described the bombings as acts of terror. Saudi Arabia is home to Mecca and Medina, the birthplace of Islam and its first capital, respectively. It has been repeatedly targeted by Sunni extremists including Islamic State, who see the ruling monarchy as heretics and accuse it of having betrayed their religion for their alliance with the West.